Like people who strive for balanced lives, grapevines are no different, so we aim to maintain balance in our vineyards. Our approach to growing and winemaking is based on the view that the vineyard is a complex environment where a variety of systems are constantly at work. We are always aware that we are dealing with living things that are sensitive to their environments; it is essential that plants be observed closely, left to their own growth in many respects, and helped along when necessary. Grape growing requires an intimate understanding of our vines and soils, and how both will respond to variables like climate, crop load, and sunlight- to name a few. Instruments help us by describing the environment and vine condition, but we believe there is no substitute for the discerning eye of an experienced grower. We recognize that every element within the vineyard environment - be it soil, moisture, microbe, or temperature - is vital to the living process from which our wines originate. Balancing these elements provides a character that is uniquely expressed in our wines. It cannot be duplicated anywhere else. Careful stewardship of our land ensures that we maintain a balanced, healthy environment for the vines that results in balance and complexity in our wines. In pursuing excellence in our wines, Stoneboat Vineyards is proud to collaborate with institutions such as the University of British Columbia, by exclusively funding the direct costs of research projects that will increase industry knowledge and enhance wine quality. 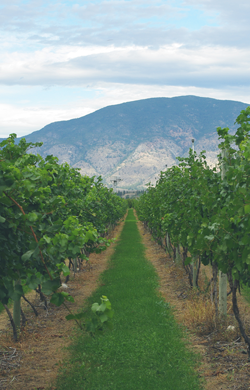 Stoneboat Vineyards does not fund indirect costs of research projects with institiutions such as the University of British Columbia.